Channels are accepting a good mix of Indian and international content now. MUMBAI: Once upon a time, the kids’ genre was the most sidelined of them all but now broadcasters have figured out how to make magic work – localised content. At the ATF Kids' Summit 2018 in Hyderabad, Broadcast Audience Research Council (BARC) COO Romil Ramgarhia threw light on Indian kids and their viewing habits. 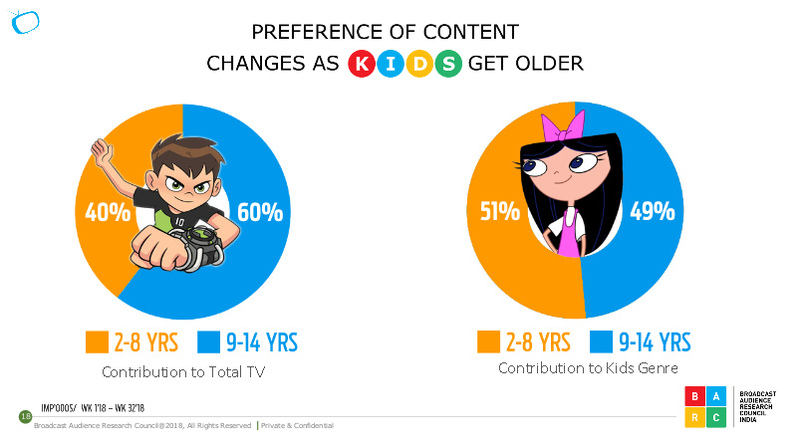 According to BARC, younger kids in the age group of two to eight years prefer watching Indian content. As far as mixed content is concerned, Indian and international, Cartoon Network garners 49 per cent of viewership from 2-8 years of age group, whereas 51 per cent from the 9-14 years of kids. Talking about the international content consumed by the viewers in the age group of 2-8 years, 45 per cent of the viewers watch Disney channel, 40 per cent and 43 per cent viewership watch Disney XD and Hungama channel respectively. Moreover, Nick channel raked in 58 per cent from the kids on Indian content, followed by 56 per cent, 54 per cent and 62 per cent viewership for Pogo TV, Discovery Kids and Sony Yay channels respectively. Ramgarhia also said that the regional flavour is catching up in the kids’ segment too. Sun TV is already broadcasting in this space. Kochu TV (Malayalam) gets 56 per cent of viewership, whereas Kushi TV (Telugu) and Chutti TV (Tamil) secured 24 per cent and 21 per cent viewership respectively in the age group of 2-14 years kids. The duration of home-grown content on national kids’ channels has grown by 18 per cent. In 2016, kids’ channels aired 33 per cent of Indian content and now in 2018, it jumped to 39 per cent. 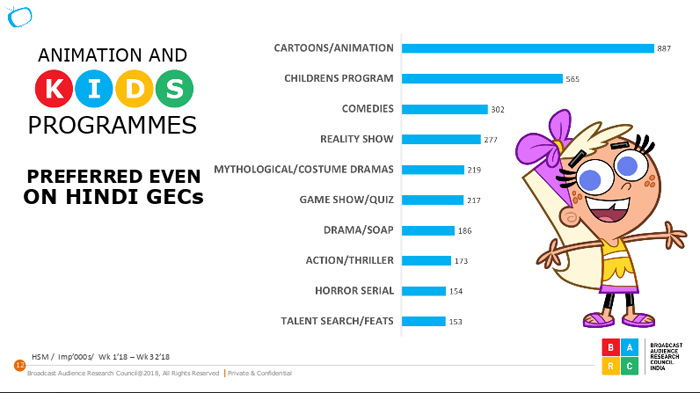 Despite the fact that kids spend about 26 per cent of their time on Hindi GECs, the time spent on kids’ channels have also witnessed a hike in the last two years. 29 per cent kids like watching Hindi GECs, followed by 18 per cent for Hindi movies and only 11 per cent kids consume kids’ channels. Since 98 per cent of Indian homes still owns a single TV, co-viewing is high. From week 1 to 32 of 2018, as per the BARC data, the total TV viewership of boys and girls in the age group of 2-14 years was 52 per cent and 48 per cent respectively. 61 per cent boys and 39 per cent girls watch animated content more on TV. Segregating the genre’s viewership on TV to rural and urban areas, urban viewership is 61 per cent while rural is 39 per cent for kids channels. The same shows a different side when it comes to overall TV viewership by kids with 46 per cent urban and 54 per cent for rural. The BARC data further showed that animation films on kids channels delivered higher viewership as compared to animated shows and games/quiz programmes. 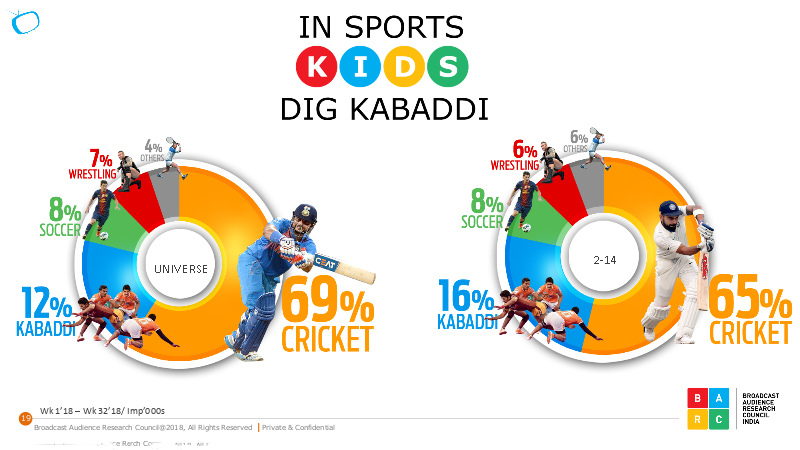 When it comes to sports, according to BARC data, kids dig kabaddi. Apart from this, cricket is the universal game that is liked by 69 per cent of the population. 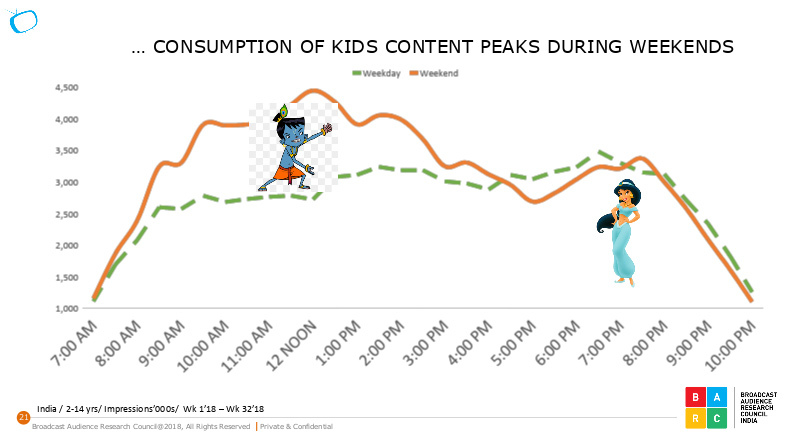 Also, the data stated that on weekends, vacations, festivals and cricket, kids tend to watch more television, especially during events like T20 World Cup, Navratri, Diwali and Christmas.